Acting, costuming and stage combat are on point! To purchase tickets visit shakespeareinthesquare. Produced by Shakespeare in the Square and Combative Theatre Co. The cast of Coriolanus: From Man to Dragon. Photo by Zach Terry. BOTTOM LINE: This wonderfully crafted adaptation will move you both emotionally and physically, although it may not be the best production for the faint of body and heart! The discontent among the populace with those scheming officials who govern them is a timely theme which rings painfully true throughout the country and throughout Shakespeare’s bloody political tragedy, Coriolanus. However, contemporary politics is governed by vitriolic rhetoric, while Coriolanus contains battles of the flesh and blood, speech and steel. A fearless warrior wins the hearts of the nobles but fails to transition to a civilian life in politics. When Coriolanus fails to court the people, he becomes the anti-hero; banished to his enemies, he rains down unmitigated vengeance upon the city of Rome. What better company to bring this work alive than the Combative Theatre Co.? In his notes to the audience, director Yuriy Pavlish boldly states that they are "laying the foundation for a new style of theater that marries the art of stage combat with dramatic storytelling into something greater than the sum of its parts." The setting of a church basement turned off-off-Broadway theatre was a surprising one and there were some growing pains with starting on schedule in the new space; however, the venue lends itself kindly to the immersive production. Audience members are beckoned and entranced by a lone drummer (Aidan Farrell) with wild hair, clad in rags and covered with dirt. Angry voices ring out, breaking the musical reverie as arguments are shouted from all sides of the surrounded audience. Within minutes the violence begins as a woman is punched directly in the face. Although the chorus of actors is mixed gender, they are referred to consistently as males (per the setting of the play), and it is clear that the female actor was playing the role of an anonymous male. Nevertheless, watching direct violence against a woman accomplishes the intended goal of both shocking the audience and setting the tone for the brutality of war. Over and over the battles are fought, sometimes with the audience surrounding the players, others with the audience enclosed in the center and watching the panopticon of violence around them. Due to the constant moving and shuffling, audience members will be on edge. While this was in part due to the intense climate of the play, it was also due to the fear of getting too close to the metal weapons, however expertly they might be wielded by the professional combat actors. Also palpable on stage is the passion and fury of Jefferson Reardon as Coriolanus. The complex role demands a fearless actor with the ability to rouse an army and kill without hesitation. He must have that type of noble bearing that despises to condescend for the populace, with the vulnerability to physically break in the presence of the mother he loves dearly (wonderfully played by Patricia Black). Reardon meets this challenge head on with a brilliant performance. A general is nothing without his soldiers, however, and Reardon is supported by an excellent cast, particularly playwright and actor Omri Kadim who excels in the dual roles of Cominius, an elite bureaucrat, and a servingman of Coriolanus’ enemy, played as a clownish oaf. There are also strong performances from Brutus (Oliver Palmer) and Sicinius (Teresa Catherine), the rabble rousing senators and schemers who move to overthrow the celebrated general. The skill of the actors is reflected in meticulous craftsmanship of their costumes, designed by Fan Zhang. Whether it is the leather sheaths of the Roman soldiers or the "shipwreck chic" tatters worn by the common people, the masterful costuming considerably elevates the quality of the production. While there is little doubt of the tremendous skill of both director Yuriy Pavlish and fight director Mitch McCoy, in crafting a physically demanding work spanning two and a half hours, there is some difficulty with the immersive element. The play begins with moving and shifting, surrounding and being surrounded by actors which is not as fascinating as it is troublesome in following the perpetual action. Battles bleed into each other more than figuratively, as it is difficult to discern which battles are happening where and why. 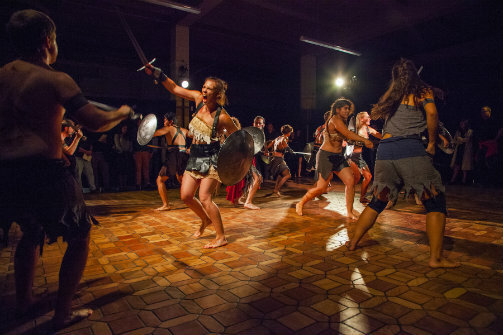 Halfway through the production, audience members are invited in a large circle around the action leaving behind full immersion, which perhaps would have been a more successful choice overall. Coriolanus: From Man to Dragon is adapted by Omri Kadim, based on a play by William Shakespeare. Directed by Yuriy Pavlish. Fight Director is Mitch McCoy. Set Design is by Collin Medford. Lighting Design is by Timothy Meola. Music Director and Drumming by Aiden Farrell. Costume Design is by Fan Zhang. Dramaturg is Chris Corbo. Stage Manager is James Swanson. The cast is Felix Birdie, Patricia Black, Olivia Boren, Teresa Catherine, Chris Dooly, Carter Gaylord, Thomas Hedlund, Omri Kadim, Brynn Knickle, Frankie Li, Ryan Marcone, Logan McCoy, Daniel Napolitano, Oliver Palmer, Cristina Ramos, Jefferson Reardon, Rivera Reese, Dylan J. Sampson, and Carlotta Summers.